PASADENA, CA-- The North American Travel Journalists Association (NATJA) has announced that Jean Peterson Design won two Gold Prizes in the 2013 Annual NATJA Awards Competition in the Visitors’ Guide and the Destination Website categories. The awards recognize the Frederick design firm for its work on behalf of the Tourism Council of Frederick County to produce the 2013 edition of Visit Frederick-The City, The County, The Region, the Tourism Council’s printed visitor guide, and for designing www.VisitFrederick.org, the organization’s website. 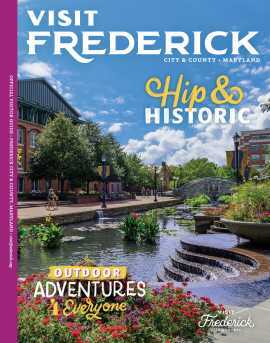 “Our staff cherishes the wealth of attractions in the Frederick area and we take great pleasure in working closely with the Tourism Council to show off the very best Frederick has to offer,” said Jean Peterson. This awards competition, now in its 22nd year, honors the “best of the best” in travel writing, photography and promotion that cover all aspects of the travel industry worldwide. NATJA Awards recognize excellence in travel writing, photojournalism, social media, multimedia platforms, advertising, marketing and public relations for the travel and tourism industry. This year, NATJA received 600 submissions from all over the world. NATJA is the second largest travel media association in North America. Members include travel media professionals, convention and visitors bureaus, social media, hotels and attractions, and other travel marketing agencies. Members are provided with professional development workshops, peer-to-peer evaluation, web tools and networking opportunities. NATJA also publishes TravelWorld International Magazine (www.travelworldmagazine.com). For more information about NATJA or a complete list of 2013 award winners and finalists, visit www.natja.org.